Welcome to Stove Stickers, the best place to find replacement markings, decals, stickers for your cooker top, range, stove, oven and hob. We have sticker decals that are designed to replace worn symbols, lettering and markings for either gas or electric cooking appliances. Have your cooker's important decals rubbed away? Does your stove look unsightly with worn decals? Are you a landlord - did you know that a stove with worn and unreadable or missing markings could be considered unsafe? 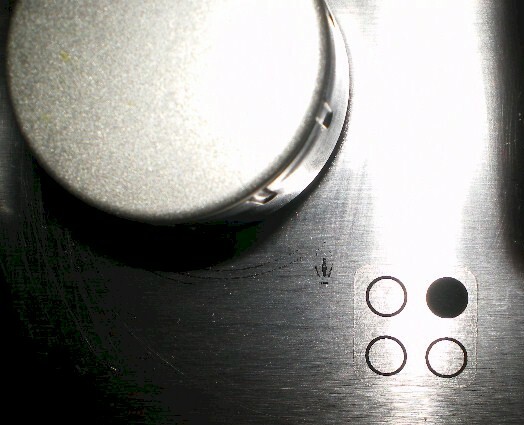 Because of worn stove/oven markings are you now considering buying a new cooker? Scroll down to check out what we have - or click here to see listings below. We have a variety of different designs all of which are made of self adhesive clear transparent laminated vinyl. They come either in black print which is good for showing up on white and stainless steel surfaces, or they are available in white print which shows up well against a black background. We also have several designs in gold print. The ink print on the stickers is protected by a thin clear film (known as laminate) and therefore the stickers can withstand a considerable amount of cleaning. They are made of heat resistant material and will withstand boiling water and will self extinguish if subjected to an ISO flame test. They are not transfers and there is no soaking in water before applying or awkward cutting with scissors. 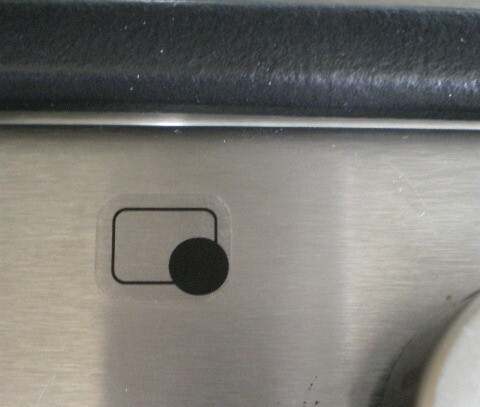 To apply is simplicity itself, just peel off one sticker at a time from their backing and stick to the stove or oven. The site is very easy to use, you do not have to register and it is ultra safe. Payment can be via PayPal or you can pay with your credit/debit card. We are a UK business established in 2012 with tens of thousands of satisfied customers. As part of our service we offer a no quibble 30 day money back guarantee. Stickers for a 4 ring stove £2.10 per single set. These may be suitable for some American style cooker tops. These may fit some American style cooker tops. These may fit some American General Electric GE* cooker tops. with additional 14 symbols. They will fit several models of Indesit* ovens. 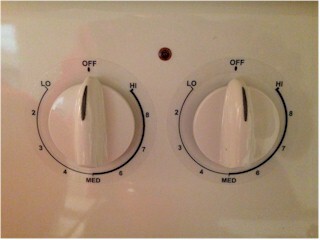 Replacement oven temperature numbers with 14 oven/stove symbols. The are suitable for some models of NEWHOME ovens. 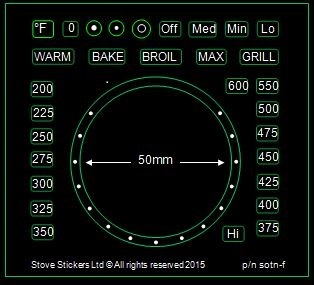 oven temperature numbers 50-250 with 44mm inner diameter +18 oven/stove symbols. 36 Separate oven control symbol stickers. What about a very unusual way to send a love message? None of our stickers are designed or calibrated for any specific oven or stove. When relabeling your appliance make sure the sticker markings being applied match the functionality and method of operation of the old markings being replaced. Mismatched markings can be a safety hazard. * Designated trademarks and brands are the property of their respective owners.